Two M. Night Shyamalan movies equals one suspenseful movie night! Both movies are spine-tingling and will keep you guessing until the end. Highly recommended if you are planning to watch some movies on Halloween or just want a good scare on a rainy night. You can never go wrong with these movies that have Mel Gibson, Shyamalan, and Joaquin Phoenix on the frontlines. 'Signs' is a movie about a family during an invasion of aliens from another planet. Mel Gibson and Joaquin Phoenix are brothers. They have locked themselves, together with Mel’s children, inside their farmhouse. This film is so full of suspense, it's almost certain to give you some goose bumps. 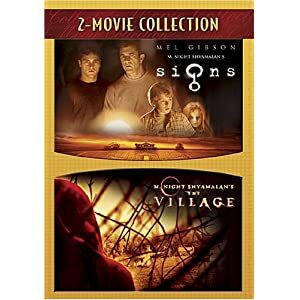 The Village is another M. Night Shyamalan movie which stars Joaquin Phoenix, Adrien Brody, William Hurt, and Sigourney Weaver (sorry, no Mel Gibson here). It is a story about a community located deep within a forest where the people can't venture trough the wilderness because of some monstrosities that are hiding in the woods. Eek! I am very impressed by your work that you have done on this website and its articles.I have got many ideas to choose a gift for men.So thank you for sharing. A lot of women become confused while purchasing gifts for the men. Because Gift selection for others in not easy. Now the admin of this website make easy for the women to share a lot of gift ideas for the men which help to buy good gift for the husband, BF, brother or cousin etc. any how, I actually want to get term paper writing services but I think my wife must like this site and save for future use. This is a very nice website and I would also like to mention that we are the suppliers of garageflooringuk.co.uk) rubber flooring for vinyl floors that are available for a reasonable price. Visit our website and have a look at our product stock. Shyamalan is a genius! Every time he makes a movie I make sure that I watch it immediately. I have a wide collection of scary movies, especially his work. This 2-movie collection is a great deal!